During the late 1970s and early 1980s, filmmaker Godfrey Reggio travelled across North America building up a collection of observational film material. With cinematograher Ron Fricke sections of this footage were crafted together using time lapse and slow motion effects plus some stock footage, into an artistic film called Koyaanisqatsi which was released in 1982. Without story or dialogue this is not a typical film, but an experimental work which sought to provoke its audience into thinking about aspects of the modern world around them and in particular how our cities and industry sit within and compete with the natural landscape. 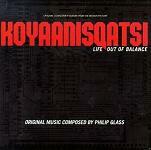 The name "Koyaanisqatsi" is a Hopi Indian word which is usually translated as "Life out of Balance". Reggio called upon the experimental composer Philip Glass to create music for his film, and he became involved at an early collaborative stage. Suffice it to say that this unconventional film made movie history. Between them, filmmaker, cinematographer and composer had created a new art form which combined their unique artistic talents, stirred some controversy but also created lots of admiring fans, and served as a rich source of ideas to inspire other filmmakers and composers. Although it wasn't the original intention of the first film, 20 years later the pair completed the third film in what is now known as the "Qatsi Trilogy". Philip Glass's music is a key part of the film's impact, and the soundtrack album makes a powerful work in its own right. Usually classified as an "experimental" composer or a "minimalist", Glass's music itself has been extremely influential with many of today's composers, from classical through to popular and particularly embracing composers for film and television. Indeed it was hearing music from Koyaanisqatsi being used on a car advert which prompted mfiles to write this review and encourage others to seek out the Philip Glass experience. The first track called simply "Koyaanisqatsi" is a typically minimal Glass movement where a repeating section for organ or keyboard is put through a number of variations where layers are added or taken away from the music. The track is dark and somber and deep male voices entone the word "Koyaanisqatsi" sounding like the chanting of Buddist Monks. Then, depending on which version of the album you can obtain, you might find a variety of tracks in different orders. The orignal soundtrack album has been criticised for being incomplete. The later re-recording from 1998 is better value with two additional tracks and fuller versions of the existing tracks but for some people the subtle difference in mood and emphasis from the film soundtrack is a minor criticism - the choice is yours! Different people will have their own favourite tracks: The wordless voices (initially unaccompanied) of "The Vessels" is particularly powerful without being intense due to its swaying meter; "Cloudscape" is driven by a large and forceful brass section; "The Grid" is by far the longest track (even in its truncated form on the original album) which really builds in intensity which when augmented by chorus drives the climactic parts of the film; and "Pruit Igoe" (which in the film accompanies the decay and demolition of a housing complex called "Pruitt-Igoe" built in St Louis in the 1950s) stands out as dynamic and exciting and is the track used on a certain television car advert. "Prophecies" is initially an apocalyptic hymn before it brings the soundtrack full circle when it bursts out of its arpeggios into a repeat of the opening chanting. Organic - woodwind arpeggios, sustained string chords and the sung word "koyaanisqatsi"